This is the first of my two-part installment "In Preparation For" the upcoming Spectre. In this article, I will be reviewing Daniel Craig's first outing as 007, Casino Royale. 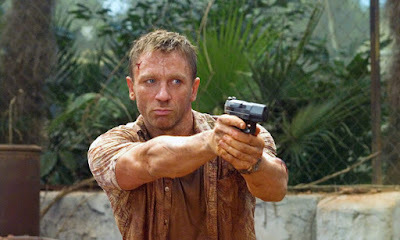 You can read my review for Skyfall here. I did skip Quantum of Solace for these reviews, as I've heard it's not that good of a movie, and I didn't really have time to watch it. This review will be filled with spoilers, as the film has been out for a number of years. So if you haven't seen the film, watch it and then read this review. 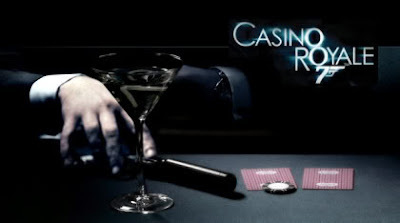 So, as we get geared up for Spectre, let's talk about Casino Royale. Casino Royale opens to find the charming and elusive spy, James Bond (Daniel Craig), going a bit rogue. He takes on his own missions, going to the extreme. Instead of simply detaining a terrorist, he shoots up an embassy. The fifteen minute chase scene between Bond and the terrorist (Sebastien Foucan) was a fantastic way to kick off the film. It was a thrilling chase, involving a lot of jumping, climbing and punching. I was on the edge of my seat watching this, because it was so engaging. Martin Campbell, though I will always hold him accountable for Green Lantern, did a marvelous job directing this film. He expertly knew how to film these scenes, allowing for a great visual experience. All of the fight choreography was very well done. It was gritty and brutal street-fighting, as opposed to a more elegant fight, which I liked. Because of how it was shot (and the amount of blood following every kick and blow), you felt each punch. This film was like the Batman Begins of James Bond: it took a classic character and made him almost noir, with a very dark and gritty edge. This movie puts James Bond in very different scenarios. Instead of always being suave and formal in a tuxedo, he was dirty and sweaty. We saw him in different countries, doing things different from typical James Bond. Craig has said the reason he took the role was because it was such a radically different Bond, not paint-by-the-numbers formulaic. While the fight scenes in the first half of the movie were good and entertaining, my favorite part of the film was the actual Casino Royale part. I love poker, so I understood what was going on, and made the scene a whole lot more enjoyable Just the facial exchanges between Craig and Mads Mikkelsen alone made the game suspenseful. It was very well shot, allowing enough poker scenes for the film to live up to its name, but also injected other elements to keep the fast pace going-- Bond gets poisoned, Bond has to fight a group of henchmen, etc. Let's talk about the villain. Le Chiffre (Mikkelsen) was a really good villain. He was very menacing and absorbed the screen whenever he was on. However, he didn't have enough to do in the film. Instead, he was used mainly to give menacing faces to Bond during the poker game. The only real time we saw what Le Chiffre was made of was when he was torturing Bond, which was a brutal and excellently well shot scene. Craig did a great job acting the scene out. Bond didn't keep his normal composure during the scene, but instead we saw a very different side of the character. He was laughing, mentally screwing with Le Chiffre. It was a very interesting scene to see played out. The twist at the end, revealing Vesper Lynd (Eva Green) to have betrayed Bond in order to give the enemy the winning profits, was good but I don't think it was set up well enough. It could have done with some more hints, because it felt really sudden and out of the blue. But the final scene with Bond fighting the henchmen in the crumbling house was excellent. The movie, however, was a bit too long. Some parts began to drag on, and it could have done with a ten to fifteen minute reduction. 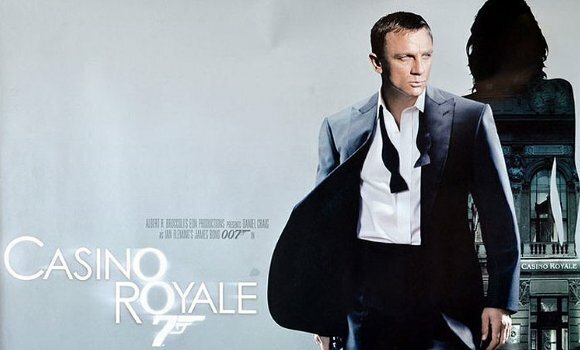 In the end, Casino Royale was a thrilling action film. Craig did a great job re-inventing Bond, and he adds a new layer to a character done so many times before. The movie has great action scenes and fight choreography, but hits its peak with the poker scene. This was a great scene to watch as a poker fan. The performances are really good by Craig, Green and Mikkelsen. However, the film could have used more of Mikkelsen, and the movie itself could have been trimmed by ten or fifteen minutes. But overall, Casiono Royale is a really good film to watch as a fan of action, and of James Bond. What do you think? Did you like Casino Royale? Are you looking forward to Spectre? Leave your thoughts in the comments section below.